Sonochemistry is the application of ultrasound to chemical reactions and processes. The mechanism causing sonochemical effects in liquids is the phenomenon of acoustic cavitation. 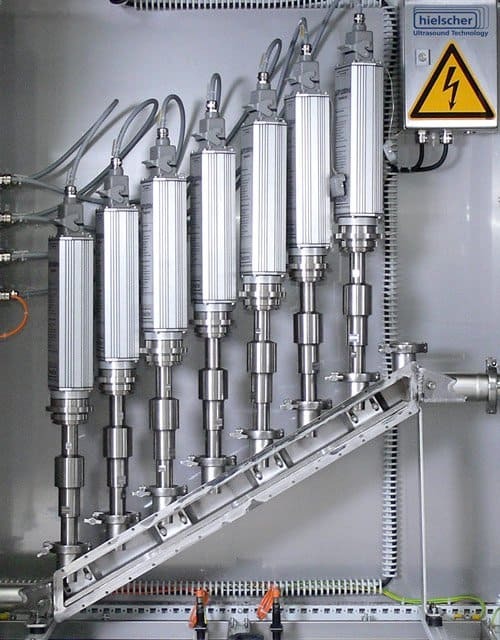 Hielscher ultrasonic laboratory and industrial devices are used in a wide range of sonochemical processes. Cavitation bubbles are vacuum bubbles. The vacuum is created by a fast moving surface on one side and an inert liquid on the other. The resulting pressure differences serve to overcome the cohesion and adhesion forces within the liquid. 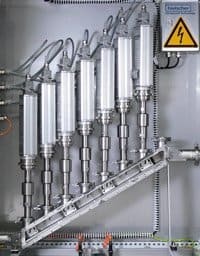 Cavitation can be produced in different ways, such as Venturi nozzles, high pressure nozzles, high velocity rotation, or ultrasonic transducers. In all those systems the input energy is transformed into friction, turbulences, waves and cavitation. The fraction of the input energy that is transformed into cavitation depends on several factors describing the movement of the cavitation generating equipment in the liquid. The intensity of acceleration is one of the most important factors influencing the efficient transformation of energy into cavitation. Higher acceleration creates higher pressure differences. This in turn increases the probability of the creation of vacuum bubbles instead of the creation of waves propagating through the liquid. Thus, the higher the acceleration the higher is the fraction of the energy that is transformed into cavitation. In case of an ultrasonic transducer, the intensity of acceleration is described by the amplitude of oscillation. Higher amplitudes result in a more effective creation of cavitation. 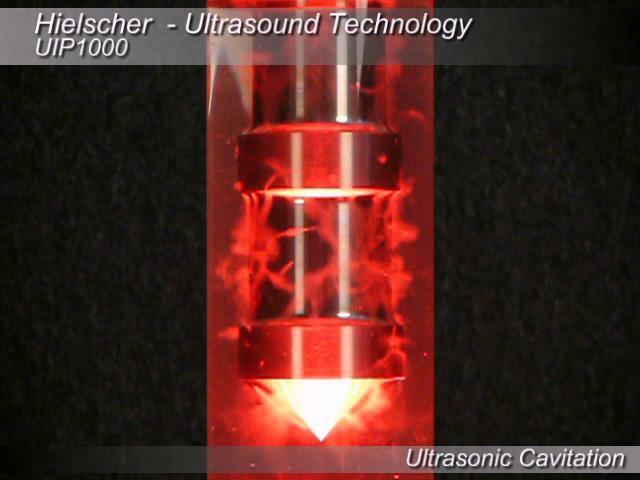 The industrial devices of Hielscher Ultrasonics can create amplitudes of up to 115 µm. These high amplitudes allow for a high power transmission ratio what in turn allows to create high power densities of up to 100 W/cm³. In addition to the intensity, the liquid should be accelerated in a way to create minimal losses in terms of turbulences, friction and wave generation. For this, the optimal way is a unilateral direction of movement. Most of the mentioned sonochemical processes can be retrofitted to work inline. We will be glad to assist you in choosing the sonochemical equipment for your processing needs. For the research and for the testing of processes we recommend our laboratory devices or the UIP1000hdT set. If required, FM and ATEX certified ultrasonic devices and reactors (e.g. UIP1000-Exd) are available for the sonication of flammable chemicals and product formulations in hazardous environments. Please use the form below, if you wish to receive more information about sonochemical methods and equipment. Ultrasonication is an alternative mechanism to heat, pressure, light or electricity to initiate chemical reactions. Jeffrey S. Moore, Charles R. Hickenboth, and their team at the Chemistry Faculty at University of Illinois at Urbana-Champaign used ultrasonic power to trigger and manipulate ring-opening reactions. Under sonication, the chemical reactions generated products different from the the ones predicted by orbital symmetry rules (Nature 2007, 446, 423). 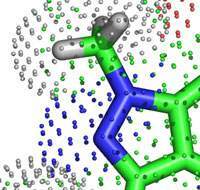 The group linked mechanically sensitive 1,2-disubstituted benzocyclobutene isomers to two polyethylene glycol chains, applied ultrasonic energy, and analyzed the bulk solutions by using C13 nuclear magnetic resonance spectroscopy. The spectra showed that both the cis and trans isomers provide the same ring-opened product, the one expected from the trans isomer. While thermal energy causes random Brownian motion of the reactants, the mechanical energy of ultrasonication provides a direction to atomic motions. Therefore, cavitational effects efficiently direct the energy by straining the molecule, reshaping the potential energy surface. Suslick, K.S. (1998): Kirk-Othmer Encyclopedia of Chemical Technology; 4th Ed. J. Wiley & Sons: New York, 1998, vol. 26, 517-541. Suslick, K. S.; Didenko, Y.; Fang, M. M.; Hyeon, T.; Kolbeck, K. J.; McNamara, W. B. III; Mdleleni, M. M.; Wong, M. (1999): Acoustic Cavitation and Its Chemical Consequences, in: Phil. Trans. Roy. Soc. A, 1999, 357, 335-353.